PROGRAM UPDATE: There are currently no BMR resale homes available for sale in Livermore. Please sign up for Hello Housing’s Stay Connected email newsletter to be notified of future resales. The city of Livermore has a portfolio of Below Market Rate homes which occasionally turn over for sale. The price of each home depends on several factors (the change in Area Median Income since the last sale, interest rates at time of resale, current HOA dues if applicable). In addition, each home is designated as either a Low or Moderate income home. Please reference the Income Limits chart to determine whether your household would qualify as either a Low or Moderate income household. Please note that each year, the City of Livermore publishes new income limits so these numbers are also adjusted annually. The most recent pre-application period did not include potential 1 & 2 bedroom BMR homes that may come up for resale. Bookmark this page or sign up to our Stay Connected emails to learn about 1 & 2 bedroom BMR opportunities in the City of Livermore. There are currently no BMR resale homes available for sale in Livermore. Applicants can qualify for up to 10 preference points based on the criteria below. 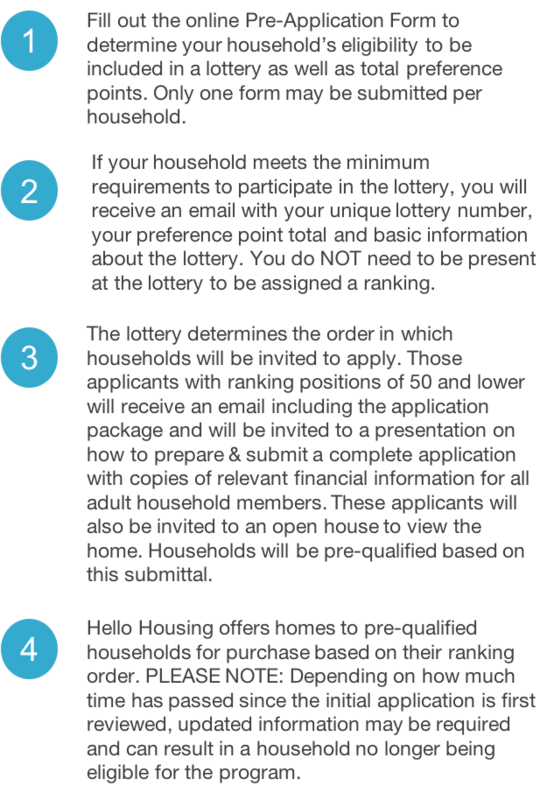 All applicants will be grouped based on the total number of preference points the household earns through any combination of preference point criteria. Priority will be given to those groups with the highest preference point total (from highest to lowest). For instance, no household with 3 preference points will be ranked higher on the waitlist than a household with 4 preference points. PLEASE NOTE that there are exclusions to these criteria which are listed in the Preference Point section of the Affordable Homeownership Guidelines and all preference points will be verified during the application process. Buying a home, especially in the Bay Area, is an emotional journey. And because of the scarcity of affordable homes for sale, the competition to buy an affordable home in today’s market can be tremendous. Our goal is to create a qualification process that meets Livermore’s program requirements AND is respectful of your time. With this in mind, we have broken the application process down into a few key steps.